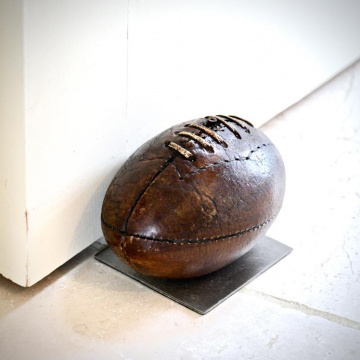 Length: 105mm / 4 1/8"
The appeal of an antique leather mini rugby ball, reproduced as a useful doorstop.The old meets the new.Steel base with a lovingly replicated antique leather rugby ball in cold cast resin.Fabulous! 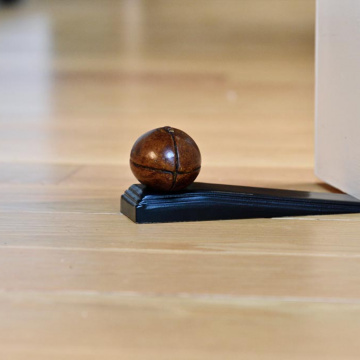 ..
Rugby, has so many followers, that this neat rugby wedge will be the answer to many present searches.Modelled on the leather Rugby balls of the early years of the game, it is a reminder of the long history of Rugby in the sporting world. Our craftsmen, lovingly make it from cold cast resin and then each one is individually painted. 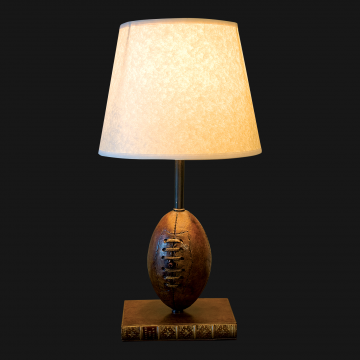 It is ..
Our Master craftsmen have made the most beautiful replica of an Antique Rugby Ball.You have to touch it to realise that it isn't real!Mounted on an Antique faux book and turned into a table lamp, this is one of our most popular items. Includes Shade 12" ..